A M 2.5 earthquake struct near Brawley, California on Sunday (star). Dozens of earthquakes were recorded in the area over the weekend. More than 100 small earthquakes have struck the Southern California-Mexico border since Saturday. But while ‘quake swarm’ sounds like the term Morgan Freeman uses in the disaster movie right before Los Angeles cracks off into the ocean, real scientists say this particular event is nothing to worry about. The precise reason quake swarms occur is not well-understood. They tend to garner attention when they do, however, because of their potential to trigger larger, deadlier earthquakes. But according to geologists, California’s latest swarm is too far south from the infamous San Andreas fault to tip off the magnitude 7+ apocalypse quake everybody’s bracing for. “If they happened a mile away we would be concerned, but these quakes are about 30 miles from the San Andreas Fault,” Caltech seismologist Lucy Jones told CNN. 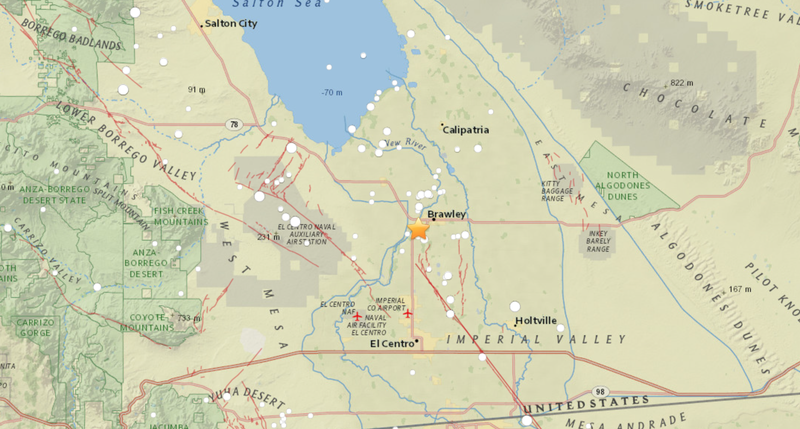 In September, a quake swarm struck the northern end of the Brawley Seismic Zone, with over 140 individual tremors recorded under the Salton Sea. That event was close enough to the southern extent of the San Andreas fault to dramatically boost the risk of a major earthquake for a short period of time. Fortunately, the Big One never came.